The Voice of the Philippines Season 2 is set to air the Battles Rounds stage on December 6, 2014 now that the coaches are done filling up the 14 slots of each of their camps during the Blinds Audition. During the Battle Rounds, an artist will go head to head against another artist from the same team. Their respective coach will have to choose which talented singer will he or she keep and which one will have to go. the artist who will not be picked to go to the next leg of the competition will have a chance to retain a spot in the competition if a coach will be willing to steal her or him. In the event that two or more coaches tries to steal an artist, the contestant will have to choose in which camp he or she will be moving in just like in the Blinds Audition. The chance to steal an artist was derived from The Voice of US. Expect more hard work, overwhelming emotions and amazing talents from each of the artist in the camps of the four coaches, Bamboo Manalac, Sarah Geronimo, Lea Salonga and Apl De Ap. Who will stay and who will have to let go? Bookmark this page to find out who will still retain the chance to be The Voice of the Philippines for Season 2. And from which team shall the next champion arise? 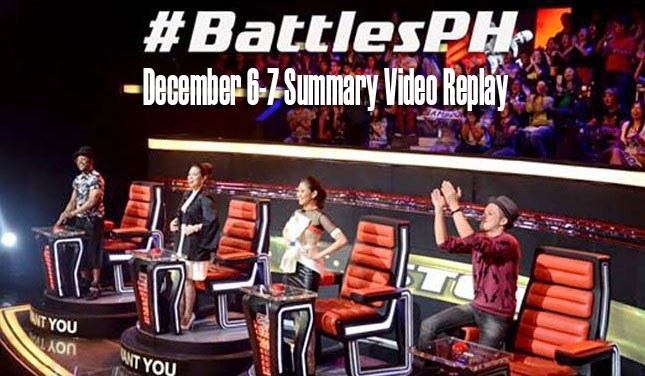 As for now, look forward to the first episode of the Battle Rounds on December 6, 2014.